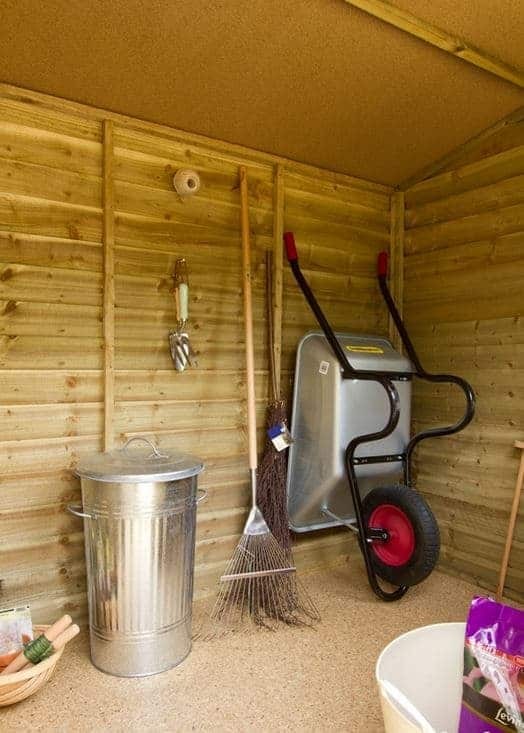 If you’re looking for that perfect place to store your tools, gardening items and more, then this shed may be exactly what you’re searching for. This one is made from pressure treated timber so you know it will hold up well over time, and offers an attractive and rustic overlap construction that blends well with most styles. The door to the shed features hasp and staple door fastening, which adds that touch of traditional elegance. It’s important to note the shed uses 8mm overlap cladding, which customers are finding not only look great, but has all kinds of other benefits as well. Its solid sheet material used on the roof means you won’t have to worry about maintenance any time soon. Even the floor is well worth noting, as it’s a solid sheet material as well, is sturdy, and the included floor bearers make it possible to level out the floor of the shed. 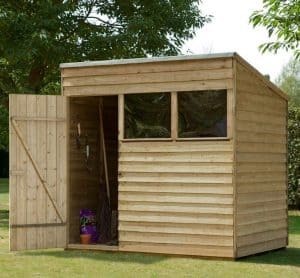 This shed is ideal for those looking for a sturdy, well-priced, low-maintenance offering that they won’t have to fuss with. Instead they will be able to look forward to reliable and yet stylish shelter for whatever they choose to store in the shed. Of course you’re interested in the specifics and we’re going to examine the actual size of the shed and the material used on it. 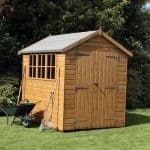 This one isn’t a massive shed, which makes it perfect for gardens that don’t have a lot of extra space. Its 7×5 size is more than enough for all your garden tools and then some. It also allows for enough extra space that you’ll find you can move around the interior and organise your items well. With the door positioned to the side of the shed, it actually ends up feeling roomier inside, a smart design element on part of Shed-Plus. As for the pent roof this one is made from it is covered in green mineral felt, which is durable and you’ll find it stands up really well to the outside elements. As well it is a 8-10mm solid sheet making it an absolute breeze to install with no experience necessary. It’s all about durability with this model and nowhere is that more obvious than with its 8mm overlap cladding, which are made from rough sawn beams. One thing we were pleased to note is that the beams have then been finished with a special treatment which results in a low maintenance option. Because of the overlap cladding, you’ll find it does an excellent job of just deflecting the water off the walls. Besides practicality and durability, this cladding has a natural finish to it that shows off the grain and knots of the wood making for a gorgeous finish. Some might not like this, but the review team personally quite like this sort of traditional finish. Despite its many pros there are also some cons with the overlap cladding here. Keep in mind that it will prevent you from being able to hang shelves in the interior. Instead you can set up a freestanding shelving unit, which also means you can move it around and place it anywhere you like in the shed. 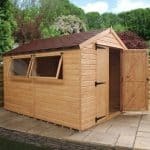 You’ll want to resist putting this shed in a full sun location in your garden as the wood will start to warp and curl over time. Tucking it under a tree is often the best spot for it. Not to worry if you have an uneven ground surface you need to place the shed on because the model comes with pressure treated bearers so you can level it out when necessary. The pressure treating means that preservatives were forced into the wood to make it last longer. This is pretty much the best form of preserving wood and we are always pleased to see it when we do a review. The floor is also a solid sheet construction, doesn’t feature the knots, and is completely flat making for an even walking and storing surface. What all of this means is that when you stack items in the shed, you know they’re staying put and you won’t have to worry about wobbly uneven surfaces. 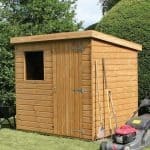 Customers don’t have to worry about putting in any extra work when they install this shed as far as treating the surfaces/materials. The pressure treated material means the work has been done for you and it’s going to hold up for a longer period of time, and also keep its new appearance that much longer. Also, you won’t have to worry about treating it later down the road. This is a huge money-saver as well as timesaver. One thing we were very pleased to see was the manufacturer stands behind the shed with an impressive 15 year warranty against decay and rot. 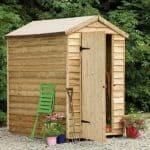 The shed features a really attractive single door complete with hasp and staple door fastening, which is not only functional but helps to add a design element to the shed. The door swings outward in a smooth and effortless fashion. The fact the door panels run in the opposite direction of the wall cladding makes for visual interest and uniqueness. It has a real rustic vibe to it that many people love, especially in an outdoor garden environment. As for the window you aren’t just getting one, but two Perspex windows both found on the front of the shed next to the door. Don’t forget the Perspex is resilient and durable, so there’s no need to wonder how long they will last. These windows let in a nice amount of light, which you’ll find useful as you dig around for what you want. While windows aren’t a priority for all, if this is something you’re looking for you’ll definitely love the effect of two. While the windows act as a great feature for some, others may find it to be a bit of a security issue especially since there are two. That’s personal preference though. If you’re a little worried on the privacy you can always place the shed next to or within greenery to give added protection. For security measures you can always add a lock to the door without any problem. There are no specific extras or customisation options suggested for this model. 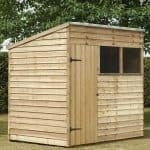 When it comes to quality this particular shed scores quite high thanks to materials such as pressure treated timber that will hold up well over time. Quality is not an issue with this particular model. Because there has been thought put into the materials that are used, and how they are put together, you’re getting a good long lifespan out of this shed so you can look at it as more of an investment piece. 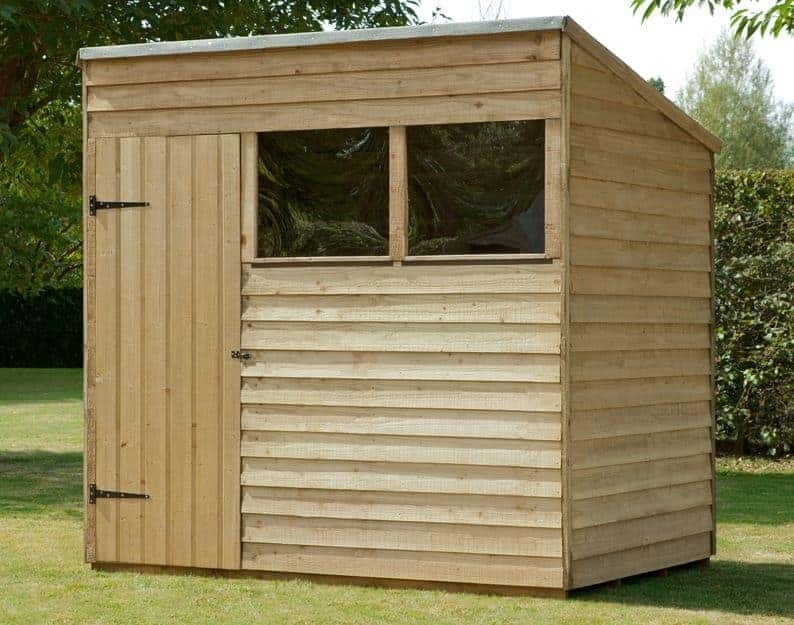 Not only is this a perfect medium-sized shed but its configuration means you’ll be able to take advantage of all the possible square footage offered in it. The door’s off centre placement works well when it comes to storage too. While no shed is ever easy to put together, if you follow along with the instructions this one is relatively easy and stress free to install. In this category for the shed scores quite high. You’re getting a lot of bang for your buck once start looking at the quality of the materials, the size of the shed, and just how attractive it is. 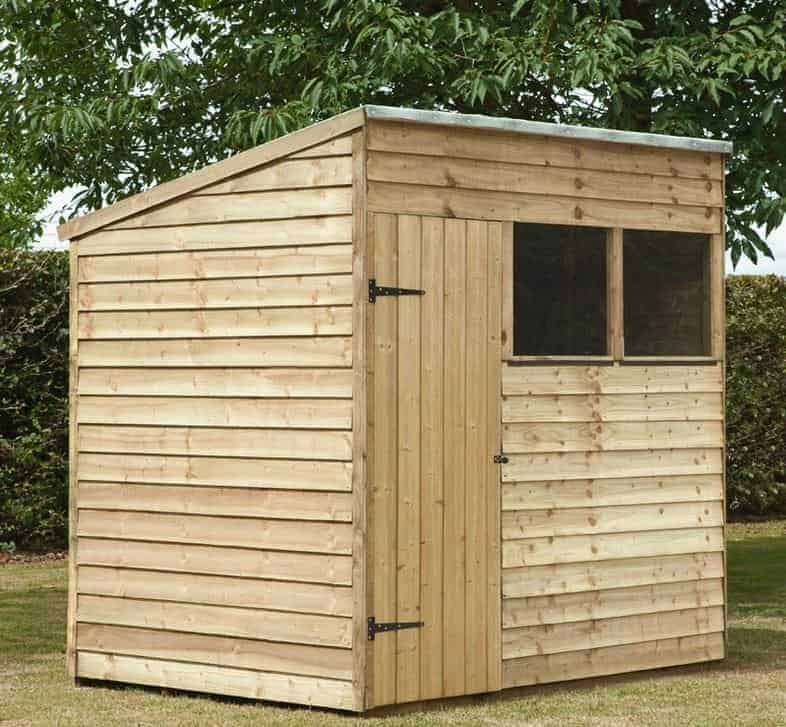 Final Thoughts: The 7'x5' Shed-Plus Pressure Treated Overlap Pent Shed is perfect for people that want ample storage space without taking up a large portion of their garden. This one offers a number of high-end features and qualities that you may not expect to find in such a reasonably priced model. Not only that but its low maintenance materials mean you won’t have to fuss with this one on a yearly basis, just install it and start enjoying it. 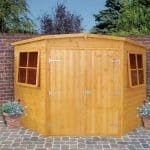 With all this said it’s hard to find many faults with this Shedstore model. If we could point out just one thing it may be the green mineral felt that is used as the roof covering. Not to worry it's still durable and will hold up well to the elements, but not everyone likes the look or the idea of felt being used and could be looking for something a little more traditional. There’s also the fact it has that unfinished look, which is rustic and attractive to some but others find it a bit dull. If that’s the case you can always stain it yourself. 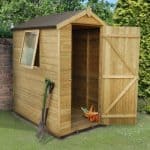 Before making this purchase look around your garden and envision where you’d like to place it as this one definitely does best tucked away out of the full sun so it doesn’t affect the cladding.